Turkey is recognised internationally as an elite golfing centre where players from around the world can meet with prestigious facilities and spectacular surroundings. Above all, the resort of Belek, 30km east of Antalya, is home to five magnificent top-class courses, with a further six under planning. Further golfing developments are also planned for Istanbul, Ankara and Mugla. WHERE CAN YOU PLAY GOLF? Belek is a modern resort situated on the Mediterranean coast. Its warm climate and proximity to Antalya, in particular the City international airport, make it an ideal year-round golfing location. The resort is set along a long, sandy beach which backs onto a forest of pine and eucalyptus trees, at the foot of the snow-capped Taurus Mountains. This top class golfing location is complimented further by hotels of the highest standard which benefit from a range of sporting and leisure facilities. 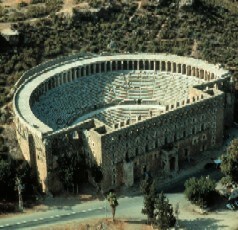 Belek also has the unique bonus of cultural and historical sights, notably the ruins of Aspendos and Perge, within easy reach. For further information, please refer to the regional guide. The Antalya Golf Club, open since 2002, consists of two 18-hole courses, the Pasha and the Sultan. Both courses were constructed by European Golf Design, a subsidiary of the PGA European Tour, under the supervision of David Jones, Northern Ireland professional. Address: Belek Turizm Merkezi, P.O. Box 33, 07500 Belek/Antalya. Properties of the Course: Pasha Course - 18 holes, Par 72, 5731m length, handicap 28 (men) and 36 (ladies). Sultan Course - 18 holes, Par 72, 6330m length, handicap 24 (men) and 28 (ladies). Course facilities comprise a restaurant, bar, pro shop, locker and storage rooms. Buggies, electric and manual trolleys and clubs are available for hire. Both individual and group lessons with PGA professionals are also available. This course was designed by French golf architect Michel Gayon, and is situated amid pine forests at the foot of the Taurus Mountain. It is considered a Gayon classic, with deep bunkers, and an average 670 m2 green areas and seven ponds of 30,000 m2. Properties of the Course: Length of the course, 6288 metres;18 holes, 842 beds, Par 72. The handicap obligations is 28 for men and 36 for women. The tee's are white, yellow, blue and red. There are 63 bunkers, which are 16,000 m2. The driving range is formed by a pond containing the target greens, and at this location in order to pass the pond with practice shots, a harsh and high shot of 203 meters is necessary. The driving range shot platform has 48 sections and two floors. Open since 1998 and designed by internationally renowned architect Dave Thomas, this championship standard course is shaped from a natural pine forest and positioned alongside Belek?s Acisu River. Properties of the course: Length of the course - 6314 metres, 18 holes, 68 beds. Par: 72. The course covers an area of 729,000m. The driving range holds 60 people. The length of the course is 5877m for men and 5103m for women, and grass is watered by a computer-controlled system. Opened in late 1994 and designed by Ryder Cup player David Feherty and Seniors Tour player David Jones, the award-winning National was the first course in Turkey to be developed according to European PGA standards. In its design, Feherty has incorporated aspects of the best courses he has competed on in the world, and has ensured that no two holes are similar. Address: Belek Turizm Merkezi 07500, Serik, Belek-Antalya. Properties of the Course: Length of the course is 6,232 metres, 18 holes, Par 72. The driving range has 40 sections. The handicap requirements are 28 for men and 36 for women. Practice facilities comprise a 40-bay driving range and two chipping and putting greens. Clubhouse facilities include a restaurant, bar, boutique, terrace, locker and storage rooms and a pro-shop. Buggies, rental trolleys, woods and irons are available for hire, and PGA professionals are on hand for individual and group lessons. Built between the sweeping Besgoz River and the Mediterranean Sea, the Tat International offers golfers not only top-class facilities, but stunning views in a magnificent setting. The 13-acre course has been designed by Hawtree of England. Address: Tatbeach Golf Hotel, P O BOX: 01 07507 Serik, Belek ? 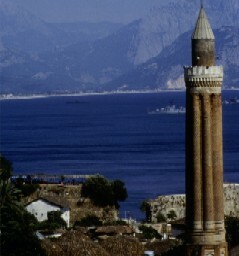 Antalya. Properties of the Course: 27 holes (3 loops of 9), 9 hole academic course, training course, bar, units, open-air swimming pool, maintenance facilities, 650 beds, international telephone and satellite. The handicap requirements are 28 (men) and 36 (women). Practice facilities include an extensive driving range, with two chipping and putting greens. The clubhouse houses two restaurants, a snack bar, lounge, boutiques, locker and storage rooms, pro shop, an outdoor swimming pool and terraces. Designed by 6-times major winner Nick Faldo, the Cornelia Faldo Course is his first ever design project in the South East Europe region: "My company, Faldo Design, is fortunate to have created courses in some truly special places around the world, and this wonderfully natural, pine-clad, sandy site is among the finest we have seen." Properties of the Course: 27 hole championship course, state-of-the art practice and game improvement facilities, plus a luxury 300 bedroom hotel and a number of associated luxury golf villas. Istanbul: a city like no other, where east meets west. The City has a grand, illustrious past, as the former capital of three successive empires, and a modern, dynamic present as Turkey's industrial and cultural centre. 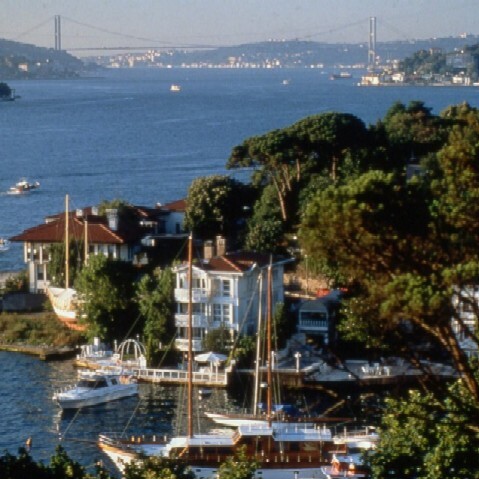 With direct year-round flights from both London and Manchester, Istanbul is easily accessible and throughout the City, a wide range of high quality accommodation is available to suit all budgets. The course was designed by one of the worlds best golf players, Tony Jacklin, and has hosted the European Challenge Tour in 1997 and 1998, and the BEKO Seniors PGA Tour in 1999. The course, during the preparation of which, British, French and Belgian golf specialists were consulted, is described as exciting and balanced by the authorities. Properties of the Course: Length of the course - 5850m, 18+9 holes, 990 beds. Par 72. The required handicap for men is 28 and 36 for ladies. In addition to the championship course, there is also a beginners course of 9 holes, as well as a driving range and putting green. Horse riding, tennis, football, swimmingfacilities are also on hand. The Kemer golf club is 30 minutes from the city centre, taking you into the Belgrade Forest. This 18-hole championship golf course, designed by Joan Dudok van Heel, according to USGA specifications, caters for all golfers whether they are beginners, or professionals in search of a challenge. Address: Goktur Koyu Uzun Kemer Mevkii Kemerburgaz, Istanbul. Properties of the Course: Length of the course 6300m, Par 73, 18 holes. Course facilities include a training course, golf club facilities, (a restaurant for 65 people, three cafe/bars, sports hall, cinema, open-air swimming pool), artificial lake, stables, mountain bike and recreation club (Dining hall for 120 people), eight tennis courts, mini football field, playground, administrative staff house. In addition, Golf and Country Club facilities include restaurants, a dining terrace, chess and billiard hall, bar, gymnasium, squash courts, sauna, Jacuzzi, winter garden, indoor swimming pool, tennis courts. Although golfers will have to wait a little longer for this Region's first proper golf course to open, 2006 sees the launch of a purpose-built Golf Village, just 8 mins from Marmaris Town Centre and set in the beautiful pine clad mountains. Facilities include a 15 Bay Golf Driving Range, 18 hole Crazy Golf Course, Pitch and Putting Green, Bowling Green, and childrens playpark, plus a cafe bar selling a range of refreshments and snacks and a sun terrace for the Sun Worshipers. 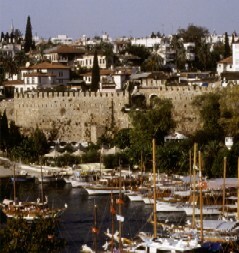 Dalaman - Dalaman region is tipped to be Turkey's next Belek and more. Seeveral golf courses are being built and the infrastructure that is being put in place will be first class. Bodrum Golf Area - For several years now, there are talks of golf courses being built just outside the Bodrum peninsula, although we would not hold our breath for that, it indeed appears as though a Dutch/Turkish joint-venture has been granted the project. Belek: The Flight time from London to Antalya is approximately four hours. Turkish Airlines offers services from London, Manchester and Dublin via Istanbul. There are also many charter flights operated by the likes of Thomas Cook and Easy Jet to Antalya airport at least 8 months of the year. Istanbul: Ataturk International Airport is accessible throughout the year with regular scheduled services operated by both Turkish Airlines and British Airways. The flight time is around three and a half hours. Dalaman: Scheduled and charter flights from all major UK airports and EU throughout the year. The golf region is within half an hour drive of the airport. Bodrum: Bodrum airport receives scheduled and charter flights suring April to October from major UK airports and EU. During winter months, access is mostly via Istanbul transfers, however, Izmir airport is 2 hours drive away.